Speck has refined an old favorite of ours and renamed it the Presidio Grip case. It's a slimmer version of the CandyShell Grip and instead of a glossy and scratch-prone shiny finish, the Presidio Grip features a scratch-resistant matte textured polycarbonate outer shell with a new rubber non-slip grip pattern embedded into it that looks to be thumbprint-inspired. This case is slim, but highly protective as it also features a dual-layer design with a new internal Impactium Shock Barrier bordering the entire circumference of the iPhone in order to effectively absorb impacts from drops. Speck's Presidio Grip has been drop-tested to protect an iPhone 7 or iPhone 7 Plus from drops up to 10ft (3.05m) and is available in multiple colorways. The Presidio Grip is one of the best cases you can get if you need extra grip and drop protection all in a slim fitted case. And so far, it's the best case that Speck has made to date. We wouldn't recommend Speck's standard Presidio case. We have it here at the office and found it to be highly slippery compared to the Presidio Grip. However, the clear Presidio variant seems to be less slippery as it doesn't have the same textured matte plastic. Grip, grip, and more grip. 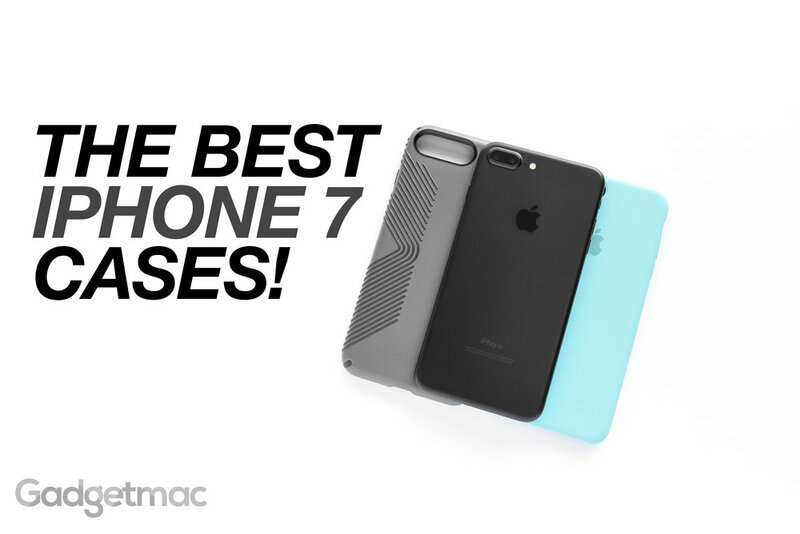 If a griptastic case is what you like, Apple's official Silicone Case for the iPhone 7 and 7 Plus is the best slim and protective case there is that offers a smooth-to-the-touch surface with loads of rubbery grip you won't want to put down. It has just the right amount of flexibility and rigidity to protect your iPhone 7 from bumps and scratches while never flexing out of place. Like Apple's Leather Case, this one also fits like a tight glove and provides that sleek feel of the iPhone's original well rounded design. We think it's one of the best practical everyday cases. Many will argue that Apple's official Leather Case for the iPhone 7 and iPhone 7 Plus is an overpriced case, but we think otherwise. For those looking for a beautifully minimalist case made out of real naturally tanned European leather, the official Leather Case by Apple is a very hard premium case to beat. While it may look familiar with its form-fitted minimalist leather design, this new version has been upgraded with individually machined aluminum buttons color-matched to the finish of the case for an even easier operation, providing incredible pressing feedback. This is the perfect non-bulky case if you want a really high-quality leather case for under $50. Note that Apple's Leather Case does not provide superior grip, but does feature a leather that is soft to the touch and will slowly develop a unique patina with use. 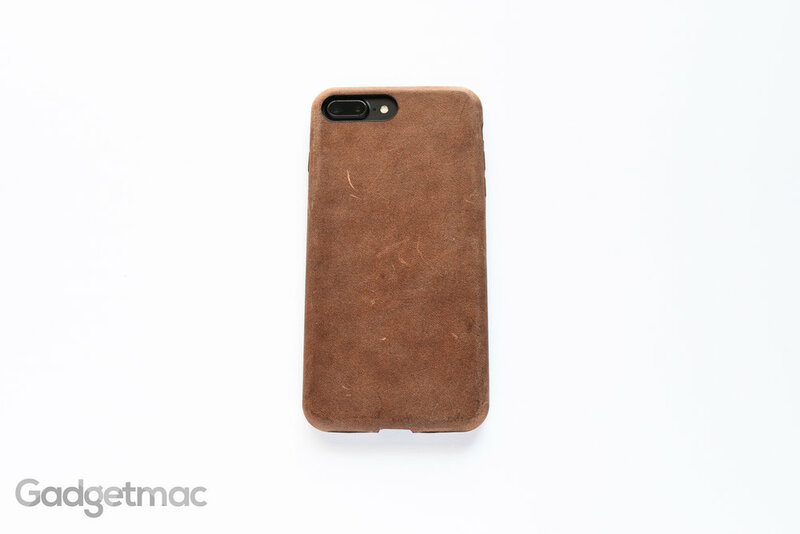 Unlike Apple's Leather Case, the Nomad Leather Case protects more of the bottom edge of the iPhone 7 and 7 Plus while leaving a big opening around the Lightning connector for superior compatibility. This case also feels less slippery and has a rougher textured leather that gives more grip. That said, other colors aren't as coarse and are more akin to Apple's smooth leather. We prefer this worn and rustic brown vintage look and feel that Nomad's American-made Horween leather has. Nomad's Leather Case is one of the better options if you dislike having an Apple logo or any kind of branding on your case and prefer something truly minimalist yet of very high quality. Nomad's Leather Case is without a doubt the next best option when looking for an Apple leather case alternative. This one is for all you lovely, fashionable ladies out there looking for a stylish looking case to spruce up their iPhone 7. This slim Kate Spade case features a black and white stripped design with reflective gold accents and a hybrid material construction to protect your device from scratches and light drops. The back of the case is a hard polycarbonate while the edges are made from a flexible rubber-like material that makes inserting or removing your iPhone much easier whilst providing a bit more protection around the front glass area. For having such a glossy finish, this case isn't as slippery as we thought it would be. It also comes in a few other styles if you don't fancy this particular black and white colorway. Tumi's Coated Canvas case for the iPhone 7 and 7 Plus offers that rough canvas finish around the back creating natural grip as well as a unique sensation of having fabric being a part of your case. Not only that, the Coated Canvas case is co-molded with shock-absorbing rubber for added bump and drop protection. This case won't appeal to everyone, but it does feel great in the hand and provides solid all-around protection for the iPhone 7 or iPhone Plus. Another really good case from Tumi is the 19 Degree case available for both the iPhone 7 and iPhone 7 Plus. This quality rigid case features a distinct and unconventional ripple pattern on the back that is available in a abrasion-resistant matte or metallic textured finish. Tumi's 19 Degree case has an integrated impact-resistant design using a combination of hard and flexible materials. You either like it or hate it, and we like it a lot. This Graph Check case for the iPhone 7 and iPhone 7 Plus from Jack Spade is definitely one of the coolest and sophisticated cases we’ve come across. Featuring a technical-looking design with a see-through graph chart print on the back side overlaying the iPhone’s aluminum, the Graph Chart case changes the original rounded shape of the iPhone to a more block-shaped one using its flat-sided rubberized border that is highly knurled in its texture for an impressive amount of grip. This semi-slim case is on the more rigid side and has a hard polycarbonate back with a semi-flexible rubbery-type border that’s easy to grip and should provide a decent amount of drop protection. We really like the unique form factor and technical fit and finish. You can also find this case in a navy blue. While it isn't a thick case, Lunatik's Air case is a lot wider and taller than all of the cases we've featured here. And that's due to its unique air-filled bumper-like design that protects the outer edges of the iPhone during a fall, which means that this case offers great drop and impact protection – but keeps a slimmer than usual thickness, meaning less pocket bulge for you. 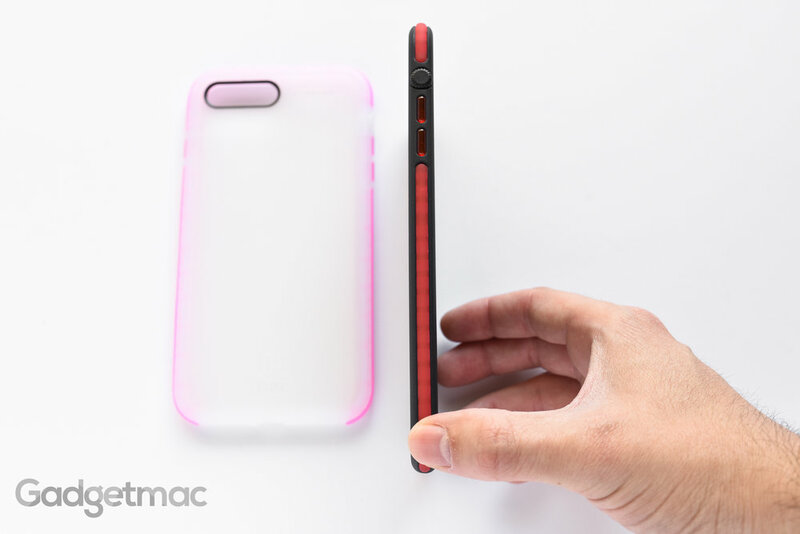 But if you want a truly slim case without any bulk, avoid the Air case as it makes using a huge phone like the iPhone 7 Plus even harder to use with one hand. It's also a looser fitting case than the rest of these cases on our list, which might mean that a drop can dislodge your phone out of the case. The Air case is available in four different colorways, some with a see-through frosted impact-resistant back shell. Tech21’s Evo Mesh for the iPhone 7 and iPhone 7 Plus is the same great case as it has always been, featuring the grippiest smoothest finish of any TPU case we’ve tested. It offers amazing scratch and drop-protection thanks to its triple-layered design which consists of Tech21’s iconic FlexShock bumper surrounding the iPhone’s outer edges, providing protection from drops as high as 10ft (3m). A dotted mesh grid pattern around the back of the case let’s you see the original color of your iPhone whilst adding a cool looking overlaid effect. And while the rest of the case is see-through, the Evo Mesh does feature a colored border that is available in multiple color options such as this white one we have here. The Evo Gem by Tech21 is the same exact protective case, but with a translucent faceted pattern around the back side instead of the Evo Mesh’s dotted styling that refract light creating that gem-like appeal. It too comes in a few different colors. The only caveat to these cases is the overly flexible bottom lip underneath the home button, which easily folds off of the device when touched. So you've spent all your savings on an iPhone and still want a case like Apple's Leather Case? Amazon's AmazonBasics Slim Case for the iPhone 7 and 7 Plus is a budget-friendly leather lookalike of the official Apple case sans any type of branding. It's just as slim, comes in a few colors, and features a leather-like look and feel. Note that Amazon described this case to have a smooth rubbery coating for a non-slip grip similar to the Apple Silicone Case, however, this case actually features a PU-type leather that doesn’t feel rubbery but more like fake leather grain. For only $10, the AmazonBasics Slim Case for the iPhone 7 and 7 Plus won’t hurt your wallet as much if you want a similar look and feel of an Apple leather case. What if we told you that you could still use a crystal clear case without it ever showing any scratches? That's exactly what Just Mobile's TENC case for the iPhone 7 and iPhone 7 Plus is capable of doing. This crystal clear flexible polycarbonate case (also available in matte clear & matte black) is one the slimmest we've tested that feels great in the hand and surprisingly isn't slippery. What's so special about it is the anti-scratch coating it has on the outside which self-heals when it gets scratched or scuffed (to a certain degree) so impressively well that you won't believe its Wolverine-like magical powers. The edges are all smooth, nicely rounded and refined making the TENC a real pleasure to use while also providing you with the enjoyment of being able to see every inch of your iPhone 7 or iPhone 7 Plus. If you want your clear case looking as pristine as the day you bought it, the TENC should be the one encasing your device. We just wouldn't recommend it if you tend to drop your phone. When you look at Urban Armor Gear’s UAG Pathfinder and Plasma cases for the iPhone 7 and iPhone 7 Plus, there’s nothing subtle about it. It might be a bit too garish for most users, but that's exactly why some of you might be really into This is one badass rugged looking case. And it doesn’t just look like it, it’s actually quite tough and will protect your iPhone 7 from relatively high drops with its 810G 516.6 military drop standard certification. All of that toughness is very well engineered into a relatively slim case. The Plasma series is just a transparent version of UAG's Pathfinder case, offering rugged drop protection with its reinforced bumper edges, a raised rubber lip for effective screen protection, soft shock-absorbing interior core and hard polycarbonate shell designed to look like futuristic armor of some sort. Urban Armor Gear's Monarch is yet another incredibly protective and unique looking case that shares a similar armored-esque styling as the Pathfinder and Plasma series of cases. The Monarch case is available for the iPhone 7 and iPhone 7 Plus in silver and graphite, and features three different types of materials in its armored design – from leather and polycarbonate, to metal hardware accents. The Monarch is relatively slim and lightweight yet offers 2X military standard drop-protection, loads of grip, and comes with a 10-year warranty. While it's primarily made out of plastic, the Monarch does offer that look of real metallic aluminum which we really like. If you want to extend that quality fit and finish afforded by a device like the iPhone 7 to the case it is being covered in, then you really need to check out one of these luxurious cases from a company based in Argentina. A fair warning though, you will be paying a premium for a case such as Vaja's Leather Grip. This is the most premium case of all for the iPhone 7 and iPhone 7 Plus on our list, and for good reason. Each case is handmade using the highest quality leather, supported by a rigid polycarbonate chassis to create a snap-on case design similar to that of Apple's own cases. The Leather Grip case is available in a slew of colors and premium leather types that will satisfy your every desire for a high-end, quality leather case. Every case features a leather interior too so not only will you enjoy the smell and feel of such luxurious leather, but your iPhone will be tightly hugged with this stuff. When it comes to one of the thinnest and slimmest cases made for the iPhone 7 and iPhone 7 Plus, Spigen has got us all covered with its amazingly slim and light AirSkin case. This type of case will only provide protection against scratches and scuff marks as it is only .36mm thick, so it's perfect if you hate adding bulk to your device yet still need some form of protection for everyday use. Spigen's AirSkin features a semi-translucent frosted finish that resists fingerprints so that you'll still be able to see the original color of your device show through, but in a slightly muted tone. This case will also turn a shiny Jet Black iPhone 7 into a matte one, just in case you're feeling a bit more stealthy. This is one of the best ultra-slim cases you can get. Who ever said serious protection couldn’t be stylish? Caseology’s beautifully designed and most importantly – inexpensive, Wavelength Series and Parallax Series of cases made for the iPhone 7 and iPhone 7 Plus blend uniquely textured geometric and ripple designs with slim ergonomics and dual layer drop-protection. Both of the Parallax Series and Parallax Series are available in multiple colorways including one in particular that will satisfy Jet Black iPhone users. If you’re looking for a sophisticated looking case to protect your investment that won’t skimp on grip, style, or cost as much as other cases from well-known brands, Caseology’s new iPhone 7 & 7 Plus cases need to be on your accessory shopping list. For those of you who are feeling the need for a genuine leather wallet case, the Nomad Leather Folio for the iPhone 7 and iPhone 7 Plus is made out of the same amazing vegetable-tanned Horween leather as its standard Leather Case featured on our list. Available in black or brown and offering a full 360-degree worth of protection, Nomad's Leather Folio features interior slots for storing up to six cards at a time as well as a side pocket to keep some extra cash on hand.